Ground floor: Entrance hall with cloakroom. Open plan kitchen (oven, microwave, dishwasher) with door to pool terrace. Living/dining room area (TV, DVD, CD, Bluetooth speaker/soundbar, piano) with doors to a covered terrace. Two double bedrooms, one with door to terrace. Bathroom. First floor: Double bedroom. Twin bedroom. Bathroom. Cloakroom (WC). Tropezienne sun terrace. Lower ground floor: Steps down from entrance hall to kitchenette area (electric hob, fridge). Laundry room with washing machine. Door to garden. For parties over 8 there are: two twin bedrooms. Bathroom. Double bedroom. Shower room (no WC). Cloakroom (WC). Outside: Large entrance, driveway and private parking. Table tennis. Covered terrace with dining table. Enclosed terraced gardens with shrubs and trees. Barbecue. Private swimming pool (11m x 6m). 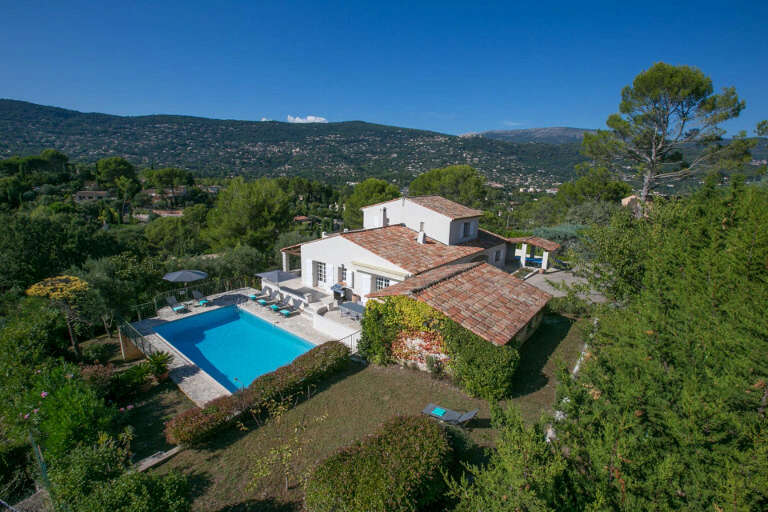 With views to the spectacular villages of Cabris and Spéracèdes, L’Estelan is a large property nestling at the end of a quiet cul-de-sac just a few minutes' drive from Peymeinade, which offers excellent amenities as well as cafés and restaurants. With its flexible accommodation for different group sizes, L’Estelan makes a wonderful choice for stress-free holidays. Tastefully renovated in light colours, this delightfully spacious villa is set over three floors in a pretty hillside location. The villa has been thoughtfully planned and comprises a mix of original wooden features, white washed walls and tiled floors. The ground floor is cool and airy with doors from the living room leading to a wonderful covered terrace with table for lazy lunches and easy evening meals. Upstairs is an enticing, tropezienne sun terrace perfect for an early morning coffee or a spot of sunbathing on your own with a good book. Fabulous for larger groups or two families, the lower ground floor offers further ample independence comprising a breakfast kitchenette with hob and fridge, three bedrooms and a further two bathrooms. In the heat of the summer these rooms remain cool and comfortable. Outside the enclosed gardens are mainly terraced, populated with mature trees and Provençal shrubs. Walking out from the kitchen is the good sized pool and the terrace that is well equipped with sun loungers and barbecue. Glimpsed from the garden, the hilltop village of Cabris is just 7.5km away, perfect for a spot of lunch in the square and browsing the boutiques and gift shops. Worth visiting also is Spéracèdes (6km). Peymeinade (3.5km) offers most amenities including a supermarket and a selection of restaurants. Continue east and you reach Grasse (9.5km) where the history of perfume can be discovered in the town’s famous perfumeries. Try some water sports (boating, canoeing and swimming) on Lake St Cassien (16km) or venture to the coast where the beaches, marinas and chic boutiques of the Côte d’Azur await. The nearest resort is Mandelieu (20km), from where a scenic drive west along the beautiful Estérel coastline is highly recommended and where you may also find secluded coves. Due to terraced grounds, drops and the tropezienne sun terrace on the first floor, younger children will need supervision. Groups of over 8 will have access to the lower ground floor three bedrooms and two extra bathrooms. Groups of up to 8 will only have access to the ground floor, first floor accommodation and laundry on the lower floor. The property will accommodate 12 adults and 2 extra children comfortably. The adventurous among you may like to try gliding at the nearby Aérodrome just south of Fayence - a unique way to enjoy the mountain and sea views of the Côte d'Azur. Peymeinade is blessed with several restaurants and a good range of shops. A weekly market is held on Monday morning so you can stock up with fresh produce for the week. There are tennis courts in Peymeinade so don't forget to pack your racquets if you are keen tennis players. include horse riding and golf. In fact golfers are spoilt for choice, with four superb courses in the Grasse area. The nearest beaches are at Mandelieu la Napoule, which are great family beaches with plenty of amenities on hand. Or you could try Théoule sur Mer and the surrounding area, which offers smaller and usually less busy beaches. Water skiing is on offer at Théoule. Grasse is internationally renowned for its perfume production, and offers ample opportunity to sample and buy perfumes and a wide variety of fragranced goods as well as discovering the origins of perfume making at the Fragonard, Molinard or Galimard perfume factories or at the fascinating Musée International de la Parfumerie. Discover the local history of the Provence region through everything from faïence pottery to toys, furniture, costumes and paintings, at the Musée d'Art et d'Histoire in Grasse. Take the Draguignan road south-west from Peymeinade, then left onto the Route du Lac for a scenic drive along the shore of Lake St Cassien. Stop off for lunch at a lakeside restaurant, and for an active afternoon hire a canoe or pedalo and go out on the water. Have a fun family day out down on the coast near Antibes, where you can choose from the Espace Marineland marine park, the Aquasplash water park, the Far West theme park and also a mini-golf course. at the Cours Honoré Cresp in the centre of Grasse, every Wednesday morning throughout the year. Built in 1971, this Zoological Parc stretches over a vast 20 hectares, which can visited either by foot or in the car. It boasts over 110 different species of mammals, reptiles and birds, and is a fantastically entertaining and educational day out for all the family. One of the most luxurious and prestigious destinations on the Côte d'Azur, Cannes is easily accessible at about 35 minutes' drive from Peymeinade, and offers a wide variety of activities for everyone. It is best known for its fashionable designer boutiques and being home to the famous annual Film Festival, which brings an influx of stars and celebrities every May. However, venture deeper into Cannes' older quarters to discover an area teeming with character, a labyrinth of winding cobbled passageways and tiny streets leading down to the Old Port, whilst enjoying the beautiful Mediterranean climate, dominated by sea, sand and sun. Enjoy a drive via the hilltop villages of Cabris, Valbonne, Vence, Eze, La Turbie. Check out the yachts at Mandelieu, Cannes, Juan les Pins or Antibes. Many famous painters and sculptors have been inspired by the light and landscape of this region, so it is no surprise that it is blessed with art galleries and museums. To name a few: the Matisse Museum and the Museum of Modern & Contemporary Art in Nice, the Renoir Museum in Cagnes-sur-Mer, the Fondation Maeght in St-Paul-de-Vence and the Picasso Museum in Antibes. Children (and energetic adults) may like to tackle a treetop adventure course of rope swings, nets, bridges etc. There is one in St Cézaire, next to the caves, or 'Canyon Forest' on the coast at Villeneuve-Loubet.